I'm very excited to announce today... Park Bench!! Park Bench is a 9 month block of the month that will be available starting January 1st. If you are interested make sure to tell your local quilt shop now so they can order it! 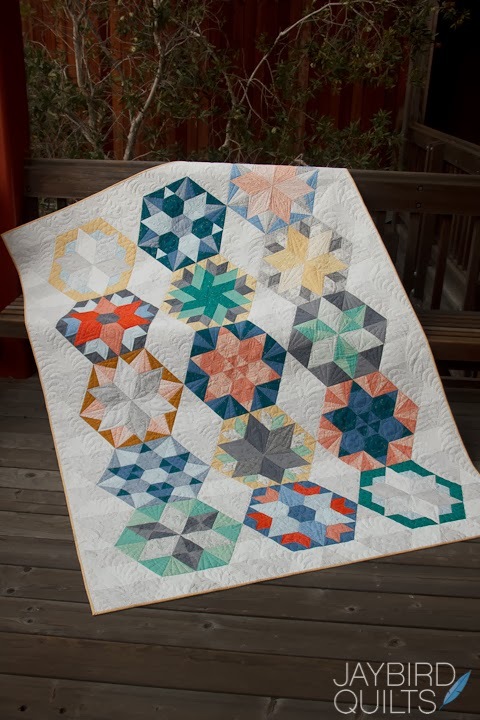 This quilt features both the Hex N More and Sidekick Rulers! Quilt measures - 65" x 88"
This pattern will be printed in a larger format than my Quilt Patterns. It will be a full color 8 1/2" x 11" Book, just like Toes in the Sand. The Book will include directions on how to make all 8 blocks and assemble the Park Bench twin size quilt. 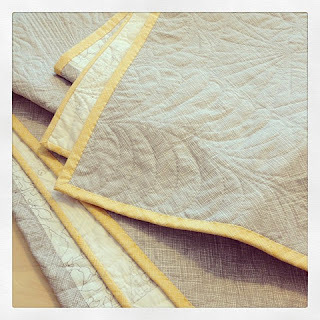 It was a marathon to get this quilt bound & photographed this week. I got it done in record time for a twin... just over 3 hours! Then it was off to shoot the cover. I am so thankful & blessed to have an amazing Fiancé. Lawrence gave up his lunch break to come help me photograph the cover. I couldn't have done it without him. Here are some photos from our cover shoot. Our first stop. The background was a bit dark, but you can really see Angela's quilting. ...but did provide a nice setting for some detail photos. I love how Angela used feathers in the background sections and more graphic designs in the actual blocks. Finally we found the right spot!! Here I am arranging up the quilt. Sometimes you need a stunt double. ...and then we got the right shot!! This is my "I'm so happy we got the shot, but so tired from all the binding" face!! Park Bench will be available January 2014. 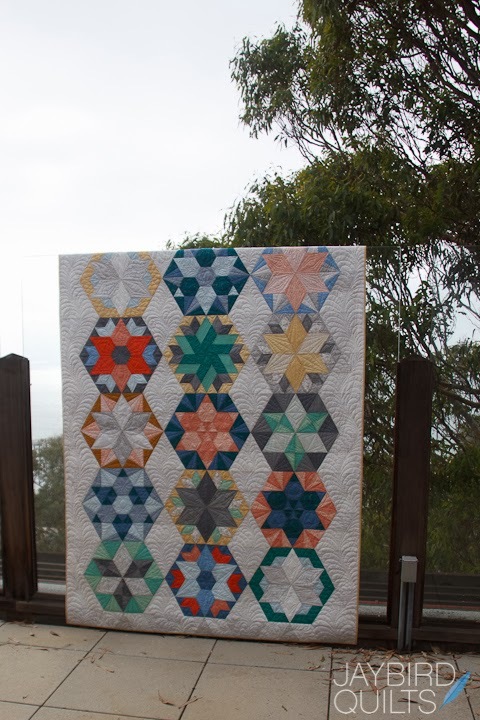 I'm currently at Quilt Market & excited to show off this quilt and all of my other quilts! Follow along with me on Instagram or Facebook. Once I'm home I will blog about the show! This is going on my Christmas list. Love it! Is this something that will be available to purchase without having to go through my local quilt shop? I would love to do it. 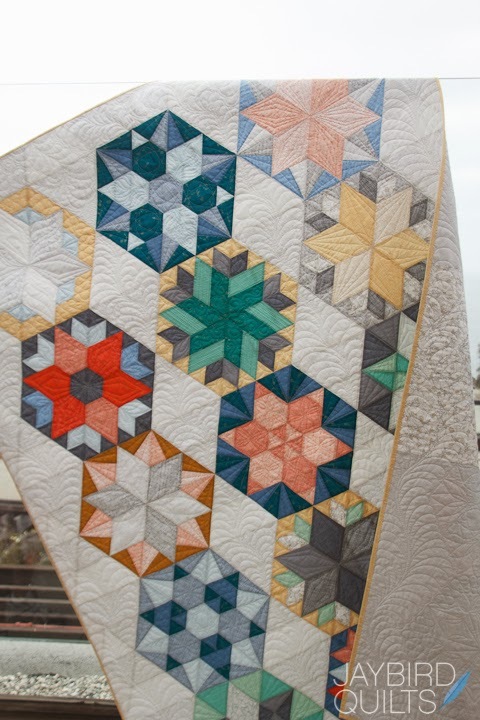 It is a beautiful quilt!!! 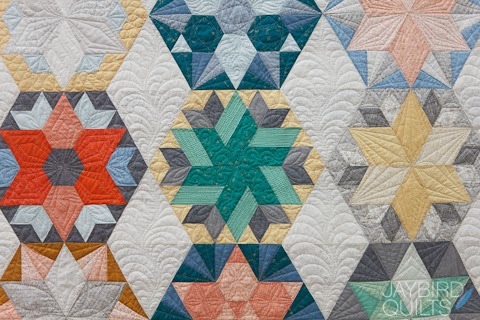 Julie your quilt is beautiful...I really like the idea of a block of the month too...what fun! 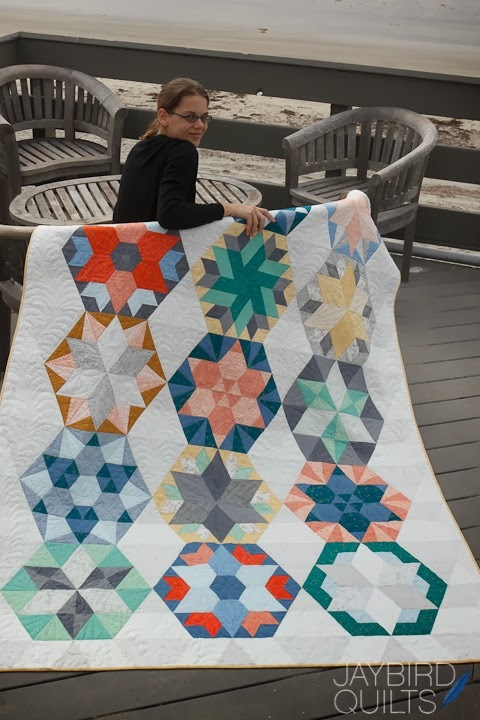 Cool quilt pattern, in block-of-the-month format. Julie you're a Genius! 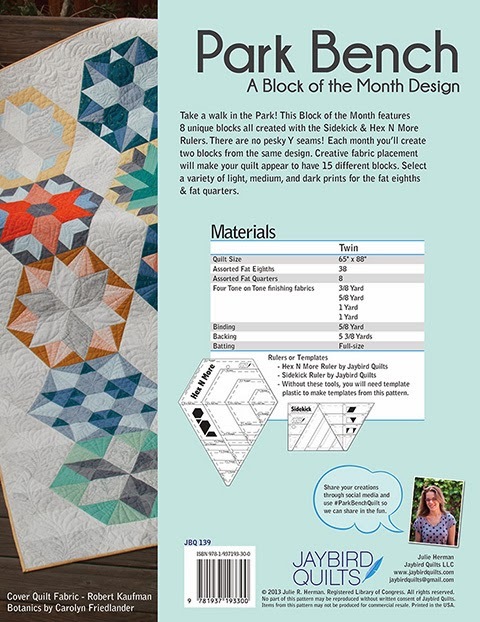 This is an amazing new block of the month. Congrats. 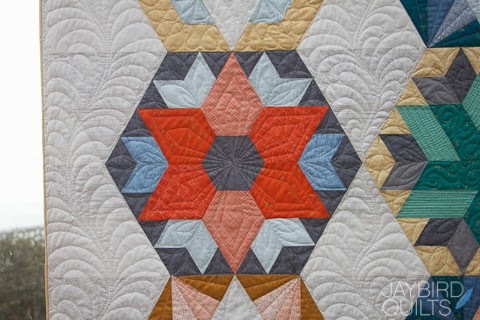 I'll be asking my favorite quilt store to get this in for me! Love it! So beautiful! It's so very inspiring to me! 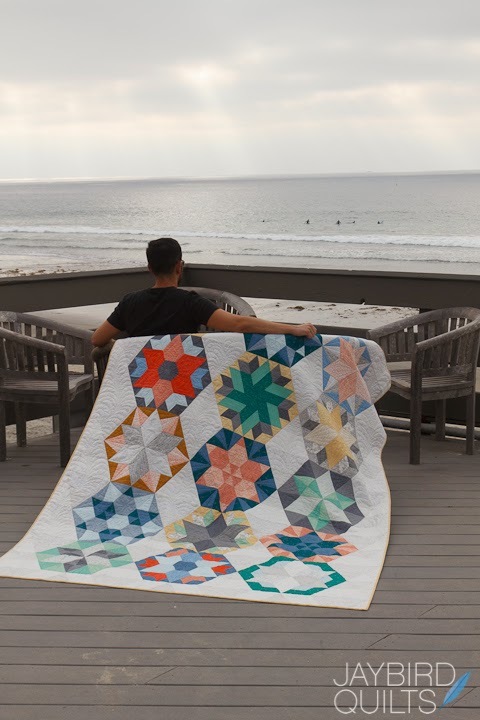 Stunning quilt, and great photo shoot! looking forward to this - hopefully some of the online shops will be involved as well ! How are there NO "Y" seams? Is it sewn on the machine? I am formulating a plan for this quilt. 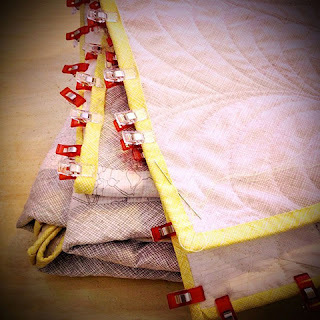 Is there a method to where the fat eights and the fat quarters go? Or are they all mixed up? I'm going to wait to buy the pattern until my dream fabric comes out (march).